this is ben’s version. 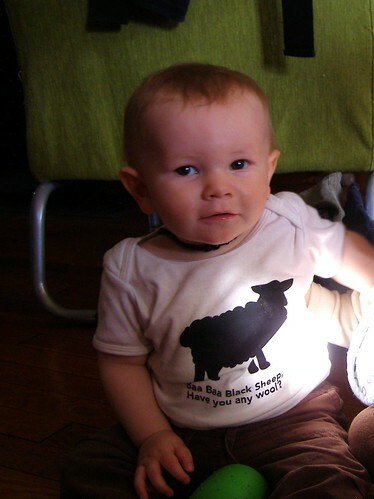 he not only has a horrible memory for lyrics, i don’t actually think he knows the real lyrics to this one :) and here’s a picture of the babe in his lovely baa baa black sheep shirt, gifted to him by a dear friend. p.s. if you’re in the DC area, you should come to this show. it’s awesome… and it’s this weekend! And feed it to Maureen …. right in the nose! I find myself exclaiming “Right in the nose!” all the time now.